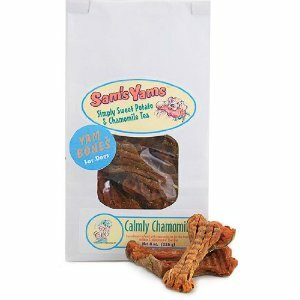 Sam's Yams Calmly Chamomile sweet potato dog treats are an all natural dog treat that are infused with chamomile. Chamomile is known as an herb that helps calms and soothes the stomach. Chamomile tea is known for it's calming effects. At Front Porch Pets, the owner decided to take their delicious, thick cut dried sweet potato treats and infuse them with chamomile. These bone shaped treats are available as a sample sizes and in 8 oz. bags. Isle of Dog treats- Chillout are whole food based, heart shaped dog treats. These delicious baked treats contain Cyracos, a patented strain of lemon balm extract, and lavender. We highly recommend these for dogs with separation anxiety and tensions caused by changes in daily routines. All ingredients obtained from whole food sources including grains, fruits, vegetables and herbs with no addition of sythetic vitamins, fillers or additives. The natural herbs help calm your canine friend. Use coupon code CALM to take 10% off your purchase of any of our dog calming products.